U.S. amateur James McLaughlin, WA2EWE/T6AF, was among the nine Americans killed in a shooting at Kabul airport Wednesday when an Afghan military pilot opened fire in an operations room of the Afghan Air Corps, according to Voice of America reporter and fellow amateur Steve Herman, W7VOA/T6AD. According to Herman, the attack was the worst single episode of an Afghan turning against his coalition partners. More information at http://cqnewsroom.blogspot.com/. This is very sad. 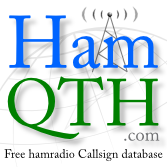 Jim was very active on CW, RTTY and SSB. R.I.P Jim! I just released new version of CQRLOG. I decided to get a new paddle to replace my 20 year old home-made mechanical one that I had had since I started in amateur radio. I had a QSO with my old friend S51M a few months ago and he told me about the P1PAD touch paddle. As you may know, we had a terrible quake in northern part of Japan on Friday afternoon last week. After three days past, more than 2000 killed and more than 10000 missing up to now. Also, the neuclear power plants located in Fukushima-pref. is getting serious situation. We as an amateur radio operator are gathering and exchanging emergency information on the following frequenies. I was looking for some details about VE2XAA/2 operation for my CQ Diamond Jubilee WAZ Award application and found this very nice interview. It's worth to read! It’s more than 3 months since our last CQRLOG release. We are not sleeping, we are working on brand new CQRLOG version.